Usain Bolt. The world's fastest human. 100m and 200m sprint world record holder. Eight-time Olympic gold medalist and eleven-time world champion. Order of Jamaica medal recipient. It has been an absolutely incredible career for the big Jamaican and a privilege to see one of the all time greats dominate the sport. But all good things must come to an end and Bolt will retire from the sport after his appearance at the London IAAF World Championships. He is already the most successful athlete in the history of the event, although he will be hoping for further gold to boost a career that already sees him cemented in sporting immortality. It will be a strange sight when the 2019 World Championships gets underway and the charismatic Jamaican is not amongst the starters, and only time will tell whether we see another sprinter of the calibre of Bolt for the rest of our lives. There are certainly big names queuing up to take over as world champion, including Canada's Andre de Grasse who has been hot on Bolt's heels for the last year or so, but it's hard to see anyone topping the Lighting Bolt's legacy. For that is probably the most incredible part of the Bolt story. Usain is not just an incredible athlete who has become the first man since mandatory timing was introduced to hold the world record in both the 100m and 200m races. His off-track performances are just as impressive, and today we highlight some of the lesser-known facts about Usain Bolt's career. Usain Bolt was an athletic kid, although he spent most of his early days playing cricket, one of the most popular sports on the island of Jamaica at the time, and also football in the street with his brother. It wasn't until the age of twelve where his pace began to stand out from his peers, and Bolt's cricket coach strongly encouraged him to pursue track and field events. Around the same time, a local priest named Reverand Nugent overheard a young Bolt arguing with close friend Ricardo Gedes about who was the faster runner. Nugent stepped in to resolve the matter by holding a sprint contest, with the winner to receive a free lunch. Usain raced to victory, and the story goes that as he tucked into his lunch, the priest informed him: 'If you can beat Ricardo, you can beat anyone'. The rest is history. Bolt's first Caribbean regional race meet was at the CARIFTA Games, where he went on to set championship records in both the 200m and 400m events. He also set records at the Central American and Caribbean Junior Championships in both events, and in his final Jamaican High School Championships appearance he completely obliterated the record books, beating the 200m time by more than half a second and the 400m by almost a second. At the 2002 World Junior Championships, held in Kingston, he became the youngest world-junior gold medallist ever when he won the 200m and turned his focus to this event, although injuries and misfortune plagued his next few years in the sport. In 2005, Bolt's manager Norman Peart and coach Glen Mills pushed Bolt to focus on longer sprinting distances and their aim was to have him competing for the 400m again by the 2008 Olympics. 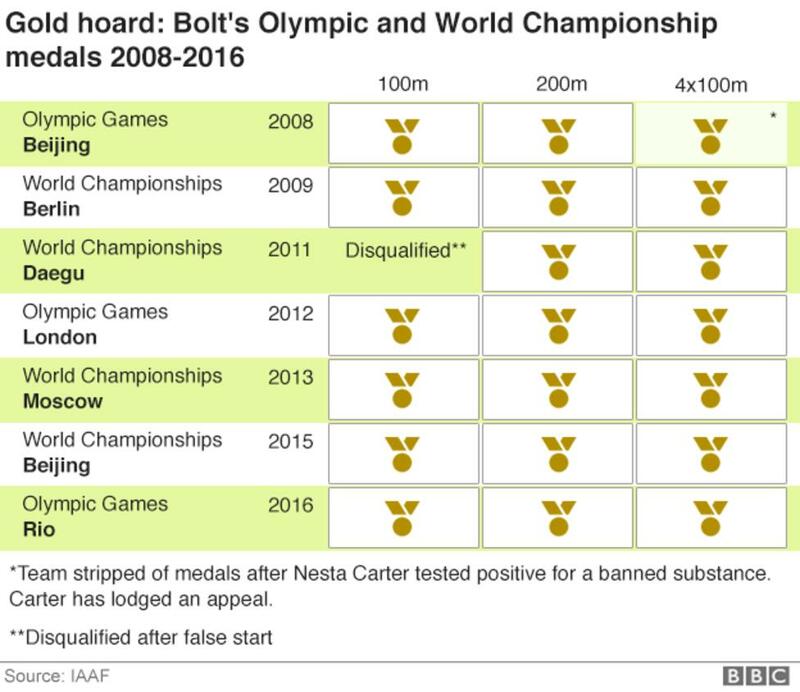 But Bolt disagreed with these recommendations and yearned to run in the 100m event as he did not feel comfortable running the 400m. Mills was skeptical, although gave Bolt a challenge - if he could beat the 36 year-old Jamaican record for the 200m (held by Don Quarrie), he would allow him to run in the 100m. Bolt broke the record by 0.11 seconds in the Jamaican Championships, and thankfully went on to compete in (and dominate) the 100m event. Fame and fortune is synonymous with the great man owing to his epic achievements on the track, but few know that from his very first sponsorship deal he was intent on giving back to the community that helped him rise to stardom. His arrangement with Puma ensures that sporting equipment is sent to former high school in Jamaica on an annual basis, so that others have a better chance of following in the footsteps of their hero. 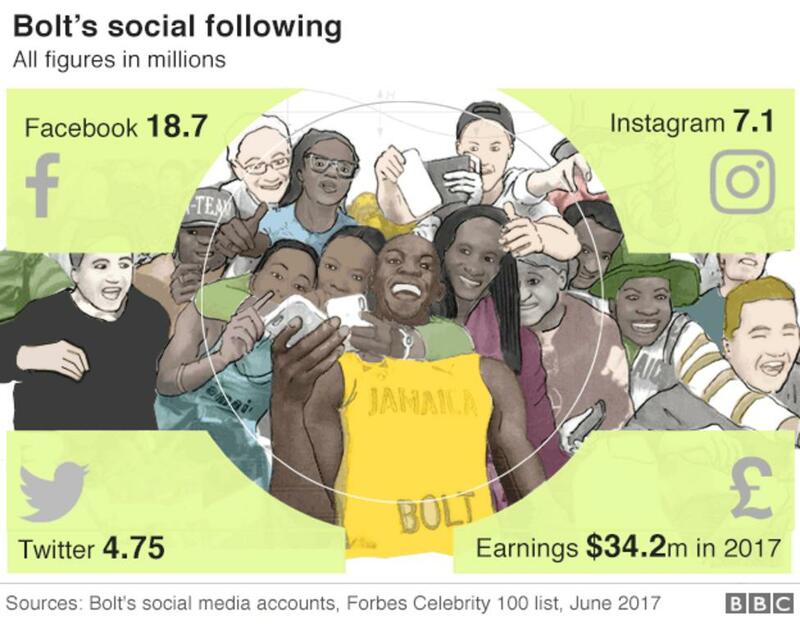 Bolt insists that any promotional videos or advertisements must be filmed in his home country using a local production crew, to boost local business and allow the country to gain greater exposure on the world stage. He also has his own foundation that works to benefit youngsters through sporting provisions, community structure enhancement and by funding talented Jamaicans so that they can excel in their skill of choice. Oh and we can't leave out Bolt's work to support wildlife conservation. In 2009, he formally adopted an abandoned cheetah cub in Nairobi and pays an annual fee to cover the upkeep at the orphanage where it came from. You simply can't not like this guy. We will have to wait and see what Bolt decides to do with himself after he hangs up the running shoes in just over a week. As one of the greatest athletes in the history of sport, not just in track and field, he will certainly be able to pick and choose sponsorship deals and business ventures. He already owns a sports bar in Jamaica and occasionally heads down to the venue to play DJ sets. Bolt is unlikely to ever fulfil his dream of playing for Manchester United, something he openly expressed interest in for most of his career, however there is a good chance he could feature in a charity match - who wouldn't want to pay and see the world's fastest man on the football pitch? Another option for Bolt is to go back to his roots and run the Racers Track Club, where he first developed into the superstar we see today. In a recent interview, he declared that he would love to be part of the club in an effort to give back to his coach and good friend Glen Mills. Whatever the future holds, we can at least look forward to a few more champion performances from an absolute legend of the sport. It is undeniable that Bolt will go down as the greatest of all time, and those attending London's World Championships will be fortunate enough to see him stride down the straight for the very last time.